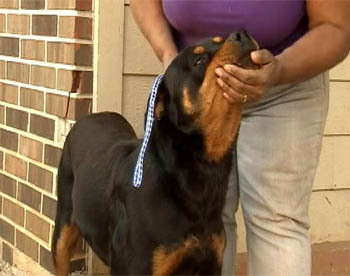 GEORGIA -- A young boy is recovering in the hospital Monday morning after being [attacked] by the family's Rottweiller. It happened Sunday while he visited his grandmother's house on Ridge Forest Drive in Stone Mountain. 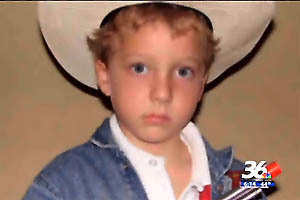 The boy's grandmother -- Lynell Dandrade -- says a friend teased the dog. When the 8-year old jumped over the fence to play with them, the Rottweiller bit him in the hands and legs. The boy was taken to DeKalb Medical Center. The dog was handed over to animal control. The Rottweiller is expected to be in quarantine for 10 days. Dandrade was cited for not having proof of rabies shots for her dog. It's unclear whether it will be put down after that. 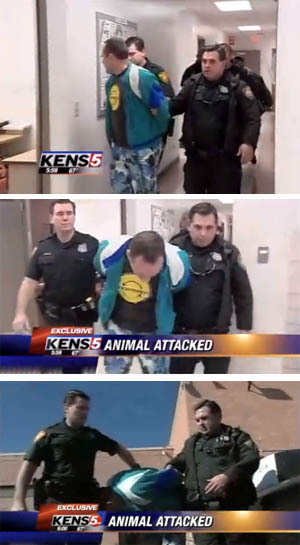 TEXAS -- A case of extreme animal cruelty has landed a local man in jail. Gerald Davison is charged with animal cruelty. Investigators said on January 13 Davison beat a small dog so badly the schnauzer is at an animal hospital with brain damage. The five-year-old dog named Chester is also paralyzed said a spokesperson with Animal Care Services (ACS). When an area emergency hospital for animals took in the dog, workers say they knew the injuries were intentional. 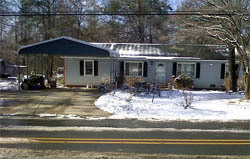 Authorities said the dog was injured during a domestic dispute with Davison's wife. Sandra Leticia Morales Davison owns Chester. She told police the she and her husband were in an argument over Chester when he grabbed the little dog and was violently shaking him and slamming his head against the wall, and then a bathroom tub. Police say a friend tried to stop Gerald, and eventually managed to get the dog away from him. "The animal at this time is still alive, but it's paralyzed and it has some serious body injuries that it's overcoming while it's in the hospital," says ACS' Vincent Medley. Now, 30-year old Davison is in a good deal of trouble. "Domestic violence and animal cruelty are closely linked. A lot of times the pets are treated worse or as poorly as people in the home are being treated," says Medley. "One partner may say to the other, 'Hey, if you do this or that, then the dog's going to get it.'" If convicted, Gerald Davison could face up to ten years in prison. UPDATE: Chester the little schnauzer who was paralyzed after an assault, is expected to go to a veterinary rehabilitation soon. 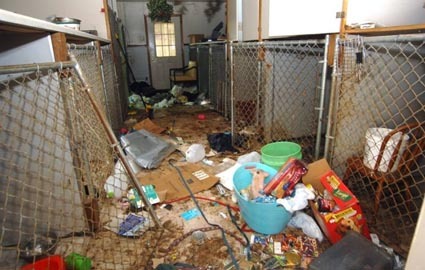 ILLINOIS -- Muddy Paws Dog Rescue's main building in Deer Park had so much sewage and other problems that a Nicor Gas employee refused to check a meter and summoned authorities for a "hazardous situation" in July 2009, Kildeer police reports state. The reports, obtained by the Daily Herald, show the responding officer told Muddy Paws operator Diane Eldrup the mess should be cleaned as soon as possible, but he didn't take further immediate action. The officer stated the report was forwarded to Deer Park village hall and two other agencies. Deer Park contracts with Kildeer for police service. Deer Park Village Administrator Jim Connors said Tuesday he never received the police report, but it could have wound up with a private company that previously handled building and zoning matters. Officials at the Illinois Department of Agriculture and Lake County Health Department said they received the police report. Kildeer Police Chief Louis Rossi didn't return calls seeking comment. 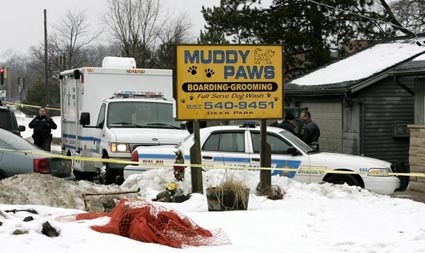 Although the reports show some problems at Muddy Paws were documented in 2009, Lake County prosecutors say they don't know when the situation began escalating to the point of finding dogs starving to death there. Eldrup, 48, was arrested Dec. 17 after police found the corpses of 20 dogs, three birds and an opossum in the building on Rand Road. Lake County prosecutors accuse Eldrup of neglecting the animals and allowing them to starve to death. Authorities said they found 5 to 10 tons of dog excrement in plastic bags in a garage next to the living quarters fronting Rand Road. Kildeer police were periodic visitors to Muddy Paws from Feb. 9, 2009, until Eldrup's arrest, records show. 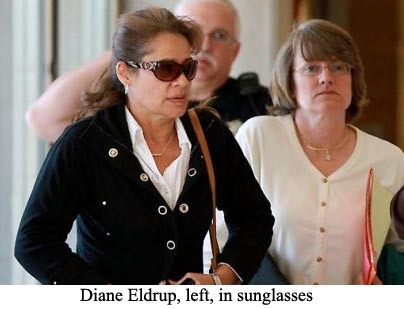 Many police responses were for domestic-type calls involving Eldrup and her estranged husband. 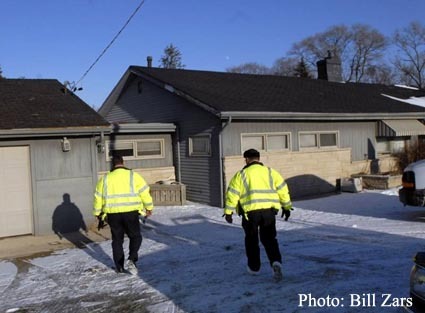 On July 21, 2009, the Nicor employee made a service call to check a meter in Muddy Paws' basement, according to Kildeer police documents obtained by the Daily Herald through the Freedom of Information Act. When he reached the basement, the Nicor worker claimed he found a backed-up sump pump and 1 to 2 inches of water near the gas meter. "(The Nicor employee) also stated he observed mold, sewage, sludge in the basement, and due to the condition he refused the check the meter," the police report states. "(The worker) also stated he could smell the sewage inside the business, and a small child with dogs in cages were in the area." Kildeer police were called by the Nicor employee for what the report labeled a "hazardous situation." Dog urine and sewage odors in the business were noted in the responding officer's report. 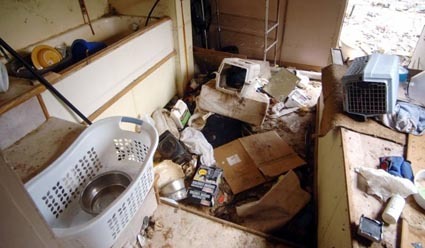 He also wrote that at least 2 inches of water and sewage were on the basement floor, and there was a strong mold odor. Eldrup was informed by the officer that a hazard existed and the problems should be addressed "as soon as possible." The officer stated the report would be sent to Deer Park, Lake County and the state's agriculture department. "I cleared, took no further action," the officer wrote. Connors said the police report describing Muddy Paws would have been valuable information to Deer Park. He said it would have been proper for someone to check to see if he received the police document. "Follow-up, follow-up, follow-up," Connors said. "That's what people expect." Connors said Muddy Paws' situation has led to changes in Deer Park's annual business registration requirement. He said a new company hired for building and zoning issues will inspect a business as part of the $125 fee. In addition, Connors said, Deer Park will verify if a business reports it is closed. He said Muddy Paws didn't have a valid registration since at least 2008, but no one checked when the building was later reported to be used only as a home. 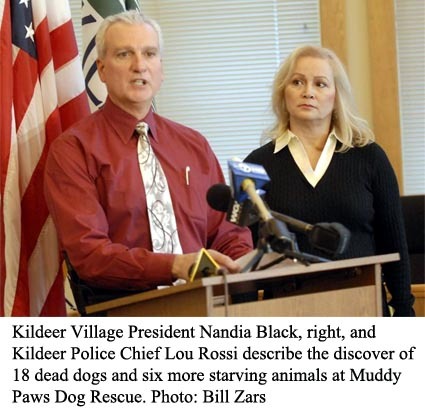 Health department spokeswoman Leslie Piotrowski said the agency visited Muddy Paws on July 24, 2009, soon after receiving the Kildeer police report. Mark Pfister, director of population health services, said an inspection found no sewer backup but rather a sump pump problem. Agriculture department spokesman Jeff Squibb said the Kildeer police report was received and led to an inspection. On Aug. 10, 2009, an inspector reported finding urine-soaked bedding and excessive dog feces at Muddy Paws. Muddy Paws was cited for operating without a license and having "conditions that did not meet the standards of the animal welfare act," according to the agriculture department. Squibb said a follow-up inspection showed a cleanup had occurred and there were no problems on Aug. 17, 2009. Officials said Muddy Paws' state license expired June 30, 2009. Squibb said officials dropped the case against Muddy Paws on May 21, 2010, after being informed the facility closed and had no animals. Squibb said the agriculture department did all it could in the Muddy Paws case within the confines of the law. "To suggest somehow any of this (animal abuse) can be prevented is absurd," Squibb said. 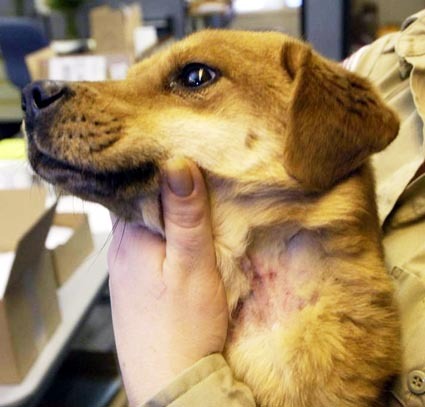 Pfister said the health department report noted flies in an area where pets were being groomed, which would have been three weeks after Muddy Paws' agriculture department license expired. Free on bond, Eldrup pleaded not guilty to charges of animal torture and aggravated animal abuse in a Lake County court appearance Monday. Authorities said Kurt Eldrup reported in December finding dead dogs at the Muddy Paws, where his estranged wife lived with the couple's 8-year-old son. MISSISSIPPI -- Pontotoc County investigators are looking into what prompted a dog attack that resulted in the death of a Pontotoc County man. Ronnie Waldo, 51, was killed when three pit bull dogs (belonging to his neighbor James Swanson) attacked him Wednesday afternoon at a home at 879 Topsy Road, off Randolph Loop. Waldo was pronounced dead at the scene. At least two of the three dogs were shot and killed by deputies after being aggressive toward them. 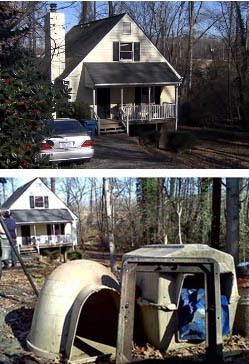 Waldo was renting property from Casey Swanson and was found by a close friend in Swanson’s front yard. Pontotoc County Sheriff Neal Davis said the case is still under investigation and would not provide any more information. More than hour after the incident reportedly happened, emergency personnel, deputies and the coroner were still on the scene. 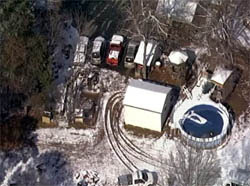 Yellow police tape around the roughly 3,500-square-foot, two-story home marked the spot where Waldo’s body was found. A half dozen pit bull puppies scurried around the yard, seemingly oblivious to the howls and growls of the adult dogs that were being corralled from the backyard by sheriff’s deputies. One by one the large dogs were carried from the backyard of the home by a catch pole looped around their necks and placed in cages in back of a truck. It took several deputies to get control of the animals, most of them not going without a fight. 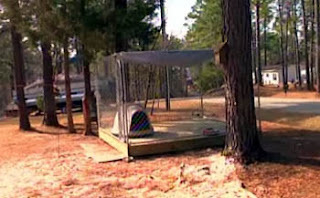 SOUTH CAROLINA -- An Edgefield County family is in mourning after their dog attacked and killed their 9-year-old girl. Kristen Dutton's grandfather says he thought the fourth-grader was playing with the family's 98-pound Japanese Akita at a home in Modoc Shores in McCormick County. The grandfather went then inside the home. About 15 minutes later, he told his grandson to tell Kristen it was time for her to come in. The grandson came back in and told the grandfather, Kristen was still on the ground, she looked dead. Kristen was taken to a local hospital, where she was pronounced dead. Leah Abercrombie, Kristen's mother, she says she's not sure what happened to make the dog attack. "She was done walking the dog. She had put the dog in the kennel. It didn't happen when she was walking the dog. She had put the dog in the kennel and was playing with him." "She played with him everyday. She walked him on the weekends. He was never aggressive toward her or nothing. I don't know what made him do it." According to South Carolina Department of Health and Environmental Control, the 98-pound dog is being tested negative for rabies. Abercrombie says her daughter will always be remembered. "Love your child everyday. Tell them you love them because this can happen to anybody. That was a precious little girl. She was the best thing ever, she was a gift"
Her mother says the Merriweather Elementary fourth grader loved animals and wanted to be a veterinarian. Today some experts say the death proves a sad point about the safety of some our family pets. Veterinarian Catherine Bloodworth say "They are in fact animals and they're not going be predictable in every area." Bloodworth says there are conditons that can lead a dog to act more aggressively, including arthritis or acute pain from an accident. Other experts say pet lovers should choose wisely when it comes to breed selection. Some dogs are breed to guard or protect and can be prone to aggression. The service for Dutton will be Wednesday in North Augusta. Sandra Friar, a spokeswoman for Edgefield County Schools, said counselors would be available for the students and staff. CALIFORNIA -- In between fits of sleeping, Rocky opens his warm chocolate eyes and gazes inquisitively at his human, his golden eyebrows arching with curiosity. 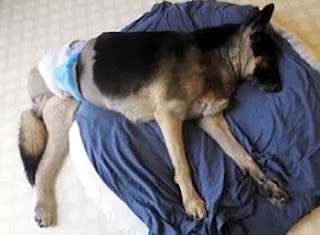 The German shepherd's tan shaven legs look almost freckled in spots as scabs heal over deep punctures. He spends much of the day on his bed, occasionally lapsing into a dream with his lone back paw kicking as if playing fetch. But it may be months before he enjoys his favorite game again. Rocky, trained in search and rescue, sustained life-threatening injuries in late December when four neighboring pit bulls broke through the fence of his Plumas Lake home and attacked him and another dog, Missy, his sister. Rocky returned home this week, still healing from an amputation and facing a long recovery as he learns life on three legs. Rocky and Missy were home alone Dec. 28 when the attack took place. Owner Sean Crabtree thinks Rocky appears to have fought for his life before a dog walker found him hours later lying in a pool of blood. The woman called Crabtree, a contractor with Beale Air Force Base, in Long Beach to tell him what happened before rushing Rocky to Northpointe Veterinary Hospital in Yuba City. Crabtree drove at more than 100 mph to get back, only to find his longtime companion in critical condition. The 7-year-old German shepherd was taken the next day to U.C. Davis Veterinary Medical Teaching Hospital, which, like U.C. Davis Medical Center does for humans, provides urgent state-of-the-art medical care and oversees complex cases. When Rocky arrived, his body was covered in life-threatening bite wounds, particularly on his right back leg, where the muscle had been ripped away, said Dr. Kate Hopper, chief of small animal emergency and critical care service. Surgeons, veterinarians and technicians worked to repair damage and prevent infections. Rocky spent several days anesthetized and on a respirator to heal his lungs, which were hurt by bites to his chest. As his leg infection threatened his life, the decision was made to amputate. And for the last three weeks, with the help of strong antibiotics and pain control, he started to mend. "We think he's over the worst, but he has a pretty long recovery ahead of him," Hopper said. "Dogs are amazingly resilient and very accepting. He seems to understand things are different." The cost of the medical bills have soared to $35,000. On Wednesday — his second day home, Rocky hopped along the sidewalk with surprising speed, pausing to mark his favorite spots and sniff scents he has missed for weeks. "His necessity to mark his territory supersedes his discomfort," Crabtree said, smiling at his dog's perseverance. Rocky makes it to the end of the block before turning to hobble home. Crabtree follows closely behind, urging him to take it easy, and the German shepherd pauses occasionally to survey the neighborhood. On his front lawn, Rocky lies down, the hundred-yard trek taxing his energy and weakened muscles. 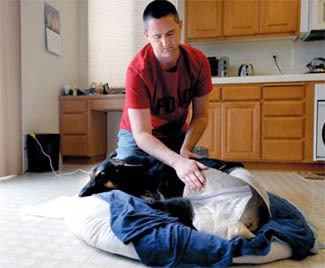 Crabtree cups his hands gently around the dog's rib cage to help him up and they continue the last few yards inside to Rocky's bed. Crabtree is now a 24-hour caretaker, seldom letting Rocky out of sight. "If you want water, you'll have to get up and get it. Don't give me pathetic eyes," he says, then helping his pet to his feet and supporting him while he slurps from a bucket. He pats the dog up and down like a drum while he sleeps, trying to break free anything harboring in his chest. When it's time, he gently opens Rocky's mouth, pops in a pill and holds his snout closed while he strokes the dog's throat to encourage him to swallow. Rocky requires medicine nearly every hour, although Crabtree was able to cut back from four shots a day to one. Eventually Rocky may need a veterinary physical therapist to push him along that final stretch of recovery to compensate for his absent leg. It may be six months before he is close to normal. He once weighed 124 pounds, but is now less than 100. Because no one was home during the incident, the circumstances are not well known, said Yuba County Sheriff's Capt. Ron Johnson. Typically in such an attack, Animal Control Services will quarantine the dogs to make sure they do not have rabies, he said. Only one of the pit bulls had a current rabies vaccine on file, so it was quarantined at home, and the other three were held for 10 days at the Yuba County animal shelter. Rocky and Missy, who was unhurt except for a lost tooth, were also monitored. Because the dogs had no previous incidents filed with the county, they were returned to their owner. The owner of the pit bulls, Josh Spurlock, was out of town when the incident took place and a neighbor let his dogs outside. His homeowner's insurance has told Crabtree it will cover the costs of Rocky's care. "They consider him chattel — property," Crabtree said. "He's a lot more than property to me. I value my dog more than some people care for their kids." Crabtree brought Rocky and Missy home when they were 4 weeks old. Their "baby photo" is framed on the mantle. Rocky's disposition made him a prime candidate for search and rescue. After Crabtree returned from deployment to Hurricane Katrina, he and Rocky went back to New Orleans. They searched for days and found many cadavers before returning home. "People say, 'It's just a dog, it's just a dog,'" Crabtree said. "He saves lives, he protects my son, he's a member of the family." UNITED KINGDOM -- A two-year-old boy is being treated in hospital for facial injuries after being mauled by his family's pet dog. 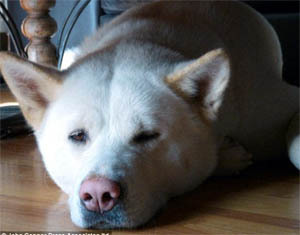 The toddler was attacked by the animal, a Japanese Akita, in Hailsham, East Sussex, on Wednesday night. The boy was taken to the Royal Sussex County Hospital in Brighton after the incident at his family home at about 8.15pm. 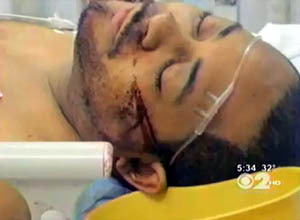 He is undergoing treatment for facial injuries, which are not considered life-threatening. A spokeswoman for Sussex Police said the Japanese Akita, which is not a banned breed, was destroyed on Wednesday night with the consent of the child's parents. Inspector Tony Wakefield, of Wealden neighbourhood policing team, said: "Although this was clearly a traumatic incident for the child and his family, this appears to be an isolated incident which occurred within the family home. "The family voluntarily agreed for the dog, which had not previously shown any aggression towards the family or the public, to be destroyed immediately." Police have not released further details of where the family live and said the boy's family have requested to be left alone by the media to concentrate on the health of their son. A South East Coast Ambulance Service spokeswoman confirmed it sent an ambulance to the scene and the child was taken to hospital under blue lights. UNITED KINGDOM -- Lewis Oliver was attacked on the face and arm by the large Japanese Akita dog, Kona, after it “snapped” without warning at his home in Hailsham, East Sussex. The two year-old suffered extensive facial injuries after the “freak accident”, which occurred at 8.15pm on Wednesday night. The toddler was rushed to the Royal Sussex County Hospital in Brighton, where he underwent emergency reconstruction surgery on Thursday. His injuries are not thought to be life-threatening. His distraught parents, Reme Keightley, 30, and Dean Oliver, a builder, who maintained a bedside vigil, were said to be "absolutely devastated" by the incident. They declined to comment. Relatives described Lewis as a “brave little soldier" who was sitting up watching television and eating in hospital. Surgeons, however, warned he is likely going to be left with extensive scarring. His parents, who also have a 13-year-old daughter, Chelsee, voluntarily handed Kona to police and the dog, which is not a dangerous breed, was immediately destroyed. Their second Akita pet dog, Patchie, is now expected to be sent to a new home. Police said no arrests were made and charges are not expected. Experts, however, called for the dog laws to change in light of the attack because the breed is prone to erratic behaviour and occasional violence. Japanese Akitas are not banned under the Dangerous Dog Act. Signs warning that "Danger Dogs Loose" and another saying "Watch Out Rottweilers About" were visible at their semi-detached home. Neighbours said the dogs had never been aggressive previously. Speaking on behalf of the family, Lewis's great aunt, Jane Keightley, from Hailsham, said the dog attacked him “on the side of the mouth” after it appeared to have “snapped”. "We are all devastated at what has happened but relieved Lewis is alive and doing well, considering,” she said. "He was bitten in the cheek and a flap of skin was hanging open and he was bitten on the arm. It sounds like the dog went for him while he was patting him. She added: “They were used to them and have never shown any violence or aggression so we don't understand what happened. Inspector Tony Wakefield, of Sussex Police, said: "Although this was clearly a traumatic incident for the child and his family, this appears to be an isolated incident which occurred within the family home. NORTH CAROLINA -- A Durham woman said she shot a dog with a shotgun and left it in the yard overnight Jan. 11 immediately after it bit her 2-year-old daughter. Durham police charged Tasheka Laquon Beatty, 33, of 311 E. Knox St., with animal cruelty the next day. 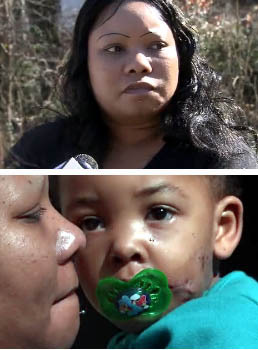 Beatty said she is not a cruel person, but she had to protect her child, Latalya, who now has a large scar on her left cheek and may need facial reconstruction surgery. "I do love animals, but I ask somebody, 'what would you do, if that was your child?" she said. Beatty said she had been keeping the dog for a friend for about a month and that Latalya was very attached to it. But the dog turned on her daughter on Jan. 11, a morning Beatty said she'll never forget. "The dog was laying down asleep. My little girl got out of bed and went to the dog and that's when he grabbed her. That's what woke me up," she said. The dog bit the girl in the face, and then went after Latalya's father. Beatty said she wasted no time in taking the dog outside and shooting it with a shotgun, before driving her daughter to Durham Regional Hospital, she said. The next day, Beatty said, she called police to have the dog taken to animal control. Police said the dog was still alive Jan. 12. Durham County Animal Control seized the dog, but refused to comment on the extent of its injuries and whether it was still alive Wednesday. Beatty said the dog died. Beatty said she doesn't regret shooting the dog, which she said was a 1-year-old pit bull named Moo Moo. "It mauled my daughter... I take full responsibility. I just think that's what any other parent would do if they (saw) what I saw," she said. ILLINOIS -- Elgin police were forced to shoot and kill a pit bull that turned on its owners and charged at officers Wednesday, officials said. Six people, including three children, were home in the 400 block of Lincoln Avenue in Elgin at about 3:30 p.m. Wednesday, when the pit bull, named Loco, attacked its own 6-day-old puppies, according to police department spokeswoman Sue Olafson. Olafson said the dog would charge and attempt to attack anyone who came near her to stop her from killing her own puppies. Police shot and killed the dog after it charged, Olafson said. None of the three adults or three children was injured, she added. “They were upstairs in the bedrooms and the dog was in the kitchen,” she said. Eight puppies were taken to area shelters by police, Olafson said. A ninth puppy was killed while two others had been bitten, she said. NORTH CAROLINA -- Two pit bulls attacked and killed a young girl and severely injured her grandmother in Union County Wednesday morning. According to the Waxhaw Police Department, five-year-old Makayla Woodard and her grandmother, 67-year-old Nancy Presson, were attacked by the dogs just after 11:00 a.m. at 325 Rehobeth Road, which is not far from downtown Waxhaw. Presson was hurt while trying to get the dogs off Makayla, police said. Makayla and Presson were transported to Carolinas Medical Center-Union in Monroe where the girl died a short time later from her injuries. Presson was under sedation and listed in stable condition in the hospital's emergency department as of Wednesday at 4 p.m. Person's daughter, who is Makayla's mother, said Wednesday night that her mother's injuries were severe, but that she would survive them. 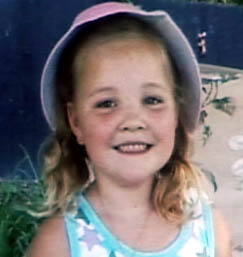 Makayla's mother also said that she was upset that the media had called the dogs vicious, even though the dogs killed her daughter. She said they had always been friendly up until Wednesday's attack. owner of the two dogs involved in the attack. Amy Plyler, who is a family member, said the girl was attacked while trying to get into a fenced-in yard adjacent to her home. 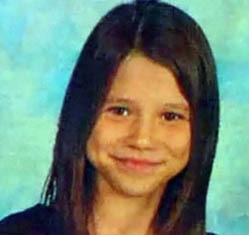 Makayla was mauled by a pit bull named Rebel which Plyler said "tended to wander the street." "I don't know if Makayla even saw them coming," she said. Investigators said Rebel was immediately killed by authorities. The other dog was on the loose for a short time, but was later fatally shot by authorities. Both dogs were owned by neighbor Michael Gordon. Waxhaw police say they had just gone to Gordon's house around Christmas and warned him about restraining his dogs. A man who lives nearby on Sweetbay Court said he heard a woman's scream around 11:10 a.m.
Scott Bland was in his driveway trying to clear snow and ice so he could go to work. "She was screaming non-stop, she would catch her breath--there were no words, just screams," said Bland who called 911. "It was like a horror film, just high-pitch squeals, a woman's voice, the screaming just got worse." girl was attacked by the dogs. Bland says when he spoke with a 911 operator, they had already received other calls concerning the attack. "It was a little bit unnerving to know the pit bull dogs were running around the neighborhood," Bland said. "This is a perfect example of why people should not allow these dogs to run loose." Waxhaw has a leash law which says that bans dog owners from letting their dogs run loose. It appears Gordon will be charged with violating the leash law, but Waxhaw police chief Michael Eiss says more charges than that could be coming. Eiss says his department has been in contact with the Union County District Attorney's office about the case, which is still officially under investigation. 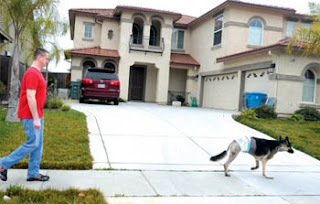 UNITED KINGDOM -- Police were this week probing an incident in which a family’s little white pet Bichon Frise dog was mauled by a Japanese Akita that had escaped from a garden. The sickening attack happened around 9am on New Year’s Day when Elizabeth Ann Thomas, from Russell Street, Burnbank, was taking her three little white Bichon Frise dogs out for their morning walk. She had just left the house and had two of the dogs on a lead and the third, who was off the leash, was walking behind. Elizabeth said: “We always have Charlie, who was attacked, and Meg on the double lead, but Mitzi, the other female, doesn’t like being on the lead. “As we got to the corner of Russell Street and Robertson Street, I noticed the Akitas pounding down the street towards me and the dogs. “It’s body language told me that it was in ‘hunt’ mode, and I was terrified for my safety and that of my wee dogs. “Before I knew it, the Akita had grabbed Charlie by the throat. It punctured and tore through his flesh and fur. “I was screaming and Mitzi, who was not on the lead, came running up to the scene. “The Akita was distracted by her and it dropped Charlie to the ground. The police were called and an emergency vet in Glasgow was contacted. The family were quoted £200 to £300 for treatment at the time, however, after all the emergency and consultation fees, treatments, surgery, labour costs, and medication were added up the bill came to a staggering £823. A further £72 vet bill from their local vet in Blantyre is also due, although the owner’s of the Akita have offered to pay the pet fees. Elizabeth added: “The very sad and unfortunate thing is that the couple who own the dog, who just live round the corner, are very responsible dog owners. “My husband, Edward, and I have seen them take their two Akita dogs, one male one female, into their car to go on outings and walks. “They explained to us that, after returning to their home on New Year’s morning after being out, someone had attempted to break into their garden shed and had the garden gate was left open . This was when the male Akita got out into the street. After the attack, the dog owners found out who their dog had attacked and visited the Thomas’s. Elizabeth added: “The couple were very upset at what their dog had done and paid the full vet costs as a gesture of goodwill. Husband Edward added: “We do appreciate the couple coming round and taking responsibility for their dog’s actions, for that they should be commended, however there is a warning to other large dog owners here, and that is that dog’s can be unpredictable, especially with small dogs and small children, where they can see them as a play toy and attack at will thinking that they are doing no wrong. A spokesman for police said they had received a complaint that the Akita had been left to roam the streets, without being on a lead. Inquiries are continuing. Anyone who witnessed the incident should contact police on Hamilton 483300. TEXAS -- A pit bull is in quarantine at the Katy animal shelter, after a homeowner in the 5300 block of Lincoln Town Drive reported that a dog killed his cat and bit him on the legs. Police were called about the attack around 10:15 a.m. on Jan. 5. The homeowner said he tried to rescue his cat when he found it in the jaws of one of three dogs running loose in his yard. The homeowner suffered bites that broke the skin on his legs, and drove himself to the hospital. Assistant Police Chief Tim Tyler said the dog was picked up and would be in quarantine at least 10 days. A homeowner in the 1000 block of Dollins Street also reported a dog bite that occurred on Jan. 2, involving his 23-year-old son. The bite required stitches on the young man’s hands and arms. The Rottweiler-pit bull mix was reported as a vicious dog, but left with its owner. 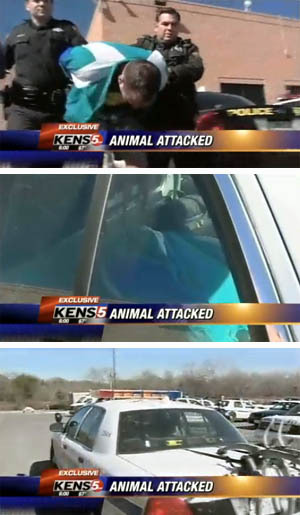 TEXAS -- A local woman was taken by AirLIFE to University Hospital in San Antonio on Sunday night after she was attacked by her dog. Around 9 p.m. emergency crews were called to FM 466 near Muehl Road for a dog attack and found more than just a few bite marks, said Guadalupe County Sheriff's Investigator Lt. Kevin Jordan. "A lady was bit by a Bull Mastiff - it was her pet," Jordan said. "The EMS believed it broke her arm and leg and she had several dog bites. The 26-year-old pet owner sought help from her husband following the attack, Jordan said. "The lady was at home, she called her husband and told him the dog attacked her - unprovoked," he said. Not knowing what caused the dog to assault his wife, the husband attempted to put the dog down and was aided by the responding Sheriff's Deputies, Jordan said. "The dog was shot by the homeowner and the deputies finished him off," Jordan said. "Animal Control took possession of the dog and will have it tested for rabies." NORTH CAROLINA -- Jakob Clark hasn’t had Christmas yet. Though family and friends have brought gifts to his room at the Levine Children’s Hospital in Uptown Charlotte, the 6-year-old is eager to return home and open his gifts from Santa. The holidays took an abrupt turn for Waxhaw’s Clark family Dec. 22 after Jakob was mauled by his cousin’s young pit bull in Mint Hill. The dog, a male named Blue, also attacked Jakob’s grandmother Muriel Price, 71, who lives next door, as she ran – barefoot – to help Jakob. As both heal, the family says they hope their story will encourage others to use caution around pit bulls. No criminal charges will be filed “because it is a family involved incident,” Mint Hill Police Lt. Anne Marie Garmon said. The youngster suffered a blood clot in his left arm, nerve damage to his right arm and right leg and has needed skin grafts. 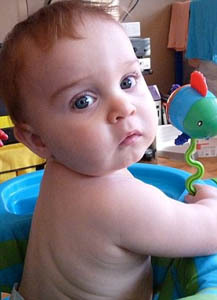 Doctors had to reattach his right eyelid but he doesn’t appear to have lost any sight, Thomas Clark, Jakob’s father said. On Wednesday, Jan. 5, Jakob endured his eighth surgery since the attack and will need more operations, including one to reconstruct the tear duct in his right eye, Thomas Clark said. Calling his son “beautiful, brave and resilient,” Thomas Clark wrote of the attack while sitting in Jakob’s hospital room this week. The St. Matthew Catholic School kindergartener, had been visiting his grandparents’ house Dec. 22 off Matthews-Mint Hill Road and was walking next door to his aunt and uncle’s house at 4514 Matthews-Mint Hill Road when Blue attacked. Jakob’s mother, Donna, was inside the house and heard Jakob scream. When she looked outside, he was on the sidewalk as Blue attacked him, Thomas Clark said. She was able to pull Jakob free and took him inside. After the attack, he said “I don’t like that dog” and then passed out, Clark said. When Price ran next door soon after, Blue bit her just below the left elbow and broke her arm, Don Price, her husband and Jakob’s grandfather, said. His wife also broke a toe on her left foot—not because of the dog but it broke when she was running to Jakob. She’s recovering at a rehabilitation center. Blue, who had been at the house for a few months, had never been aggressive before, family members said. He’d played with the kids, and Muriel Price had taken walks with the dog, Don Price said. Authorities took Blue to Charlotte-Mecklenburg’s Animal Care & Control and he was euthanized the day of the attack. He tested negative for rabies, Animal Care & Control spokeswoman Melissa Knicely said. But Thomas Clark wishes he’d done his homework before allowing his children near the pooch. The family has a German shepherd, and since the attack, Jakob has asked that she not be there when he comes home. “I feel largely to blame for not knowing better, and that’s what hurts,” he said. “I blame myself for this because I didn’t know any better. It’s not a size issue. When (pit bulls) snap, they snap. Other dogs you end up with a puncture wound. Pit bulls are a bite-and-shake kind of dog. I’m not opposed to the breed. I’m opposed to having the breed have access to people in uncontrolled situations. MAINE -- A Canton man who owns two pit bulls faces multiple charges in connection with an attack on a llama last Friday in Monmouth. Following two days of searching by police, sheriff's deputies and animal control officers, Corey LaMontagne, 33, of Route 108 was charged Tuesday with two counts each of owning a dangerous dog, having unlicensed dogs and having dogs at large. 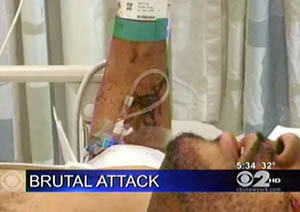 recovering from injuries after he was attacked by pit bulls. LaMontagne was being held at the Androscoggin County Jail on an unrelated warrant when he confessed, said Michael Costello, Monmouth's animal control officer. "He turned around and admitted the whole thing," Costello said. 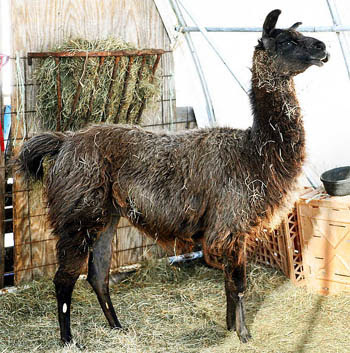 LaMontagne told police that he was visiting a friend last Friday in Monmouth when the two dogs ran loose and attacked the llama at Snafu Acres Farm on Tillson Road. 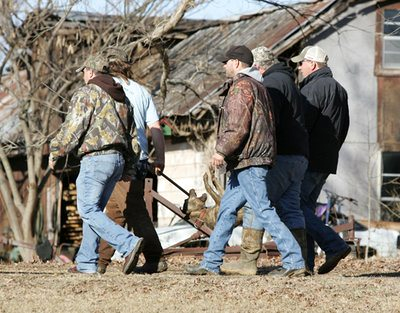 Farm owner Ivan Smith witnessed part of the attack. He saw the dogs run to an SUV that drove off. Costello spent most of Monday and Tuesday trying to find the dogs and their owner, he said. Police officers in Monmouth and Winthrop helped. So did the Androscoggin County Sheriff's Office and Wendell Strout, Lewiston-Auburn's animal control officer. 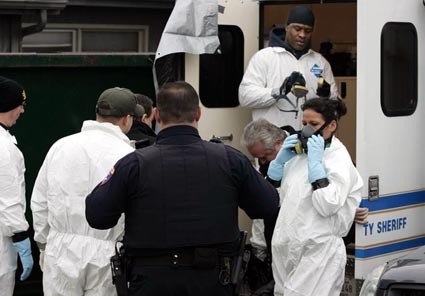 Smith's description of the dogs — one blue-tinted, one black and white — helped authorities find their veterinarian and connect with LaMontagne. He is scheduled to appear in court on Feb. 16. Until then, he is required to call Costello before leaving home. If he leaves with the dogs, they must be leashed and muzzled at all times, Costello said. Because he fled with the attack dogs and tried to hide, he shouldn't have been allowed to keep them. Clearly, he is an irresponsible moron. Ivan Smith's wife, Nancy, said she was grateful that LaMontagne was found. "We are both relieved that the dogs won't be back," she said. She has been heartened by the recovery of the llama, named Abra. The 20-year-old llama's first nights and days after the attack were rough. He suffered puncture wounds and tears to his lips, ears, nose and neck. In some places, the wounds tore deep enough to reach cartilage. On Thursday, he was home in his pen. His wounds were largely hidden by a thick, brown coat of fleece. 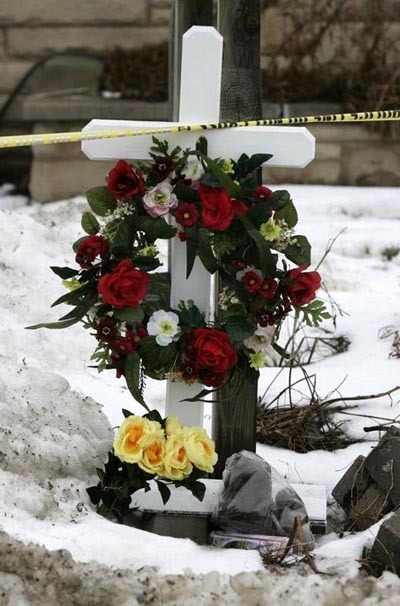 "I think his coat played down the amount of blood that was there," Nancy Smith said. But he is feeling better. "His breathing is much better today." His condition has been followed on Facebook, where he has more than 150 friends, Smith said. "People have been genuinely concerned about Abra," she said. OREGON -- The Oregon Humane Society cited a Multnomah County woman today for animal neglect after finding her 15-old horse dead. The humane society received a complaint regarding the horse the night of Sunday, Jan. 2. The OHS officer went to Northwest Skyline Drive in Portland to investigate on Monday morning and found the horse, named Kona, had already died. A blood analysis revealed that Kona had suffered from a severe systemic infection that had gone untreated over a long period of time. She was also severely malnourished; owner Jaimie Hilton admitted Kona was about 700 pounds underweight when she died. 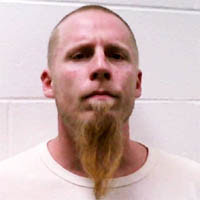 The officer cited Hilton with first and second degree animal neglect. She faces up to 12 months in jail and a fine of up to $6,250. NEW YORK -- When Maureen Martin looked out from her second-floor apartment on Wednesday night, she saw a pack of dogs attacking her neighbor. “Another big dog came and they just threw him on the floor and they were eating the guy,” Martin said. Police said two Rottweiler’s and a Wheaton terrier mix attacked Craig Jones as he walked along East 4th Street around 9:30 p.m.
As CBS 2′s Lou Young reports, Jones, a 38-year-old electrician, was returning returning home from the grocery store when the dog pack struck. His most serious injuries are too gruesome for television. “I saw three huge dogs on top of him and he was just screaming. He was already bloody. His leg was being ripped open,” witness Dee Dee Smith said. The victim was just trying to get to his front door but the dogs kept attacking. They brought him down, chewed him up and began dragging him back toward the street. Horrified neighbors alerted by his screams began throwing things out the window. A brick finally hit one of the dogs and seemed to break the spell. “I was right there hanging out of my living room window and I about fell out. That’s how close to him. I’m still scared. I don’t even want to go grocery shopping today I’m so scared,” Smith said. 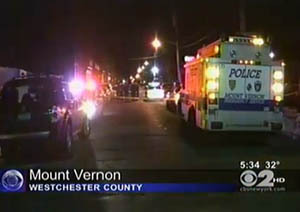 Responding Mount Vernon Police officers shot and killed one of the animals and captured another. Witnesses said the third dog got away. “That could have been my baby. That could have been anyone. I’m very upset about it,” neighbor Joan Murray said. Police told Young the dogs escaped from an auto body shop. 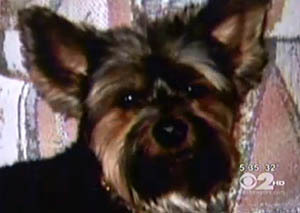 Two of the same animals were involved in the August dog pack killing of neighbors’ pet Yorkie. That dog’s owner said Wednesday night’s attack could’ve been prevented. “They should’ve been put down most definitely. 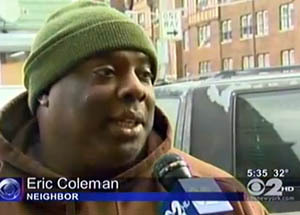 Something should’ve been done and I had a feeling something like this was gonna happen again,” Eric Coleman said. “I still hurt from losing that dog. This should not have happened. This could have been avoided,” Deana Young told 1010 WINS’ Maloney. Deana Young blames the city of Mount Vernon for not doing anything. “You cannot have a pack of dogs like that and not expect something like this to happen,” Deana Young said. 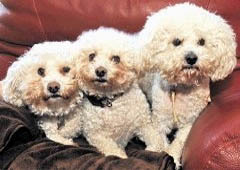 A police spokesman said after the August attack the dogs were returned to the owner by court order. So far no formal charges have been filed, but the animal remains in quarantine at the animal shelter. The dogs’ owner was not at the auto body shop when the animals escaped, police said. An employee apparently left a gate open. Medical officials transported Jones to Jacobi Medical Center in the Bronx where he was treated for serious injuries to his head and legs. He was listed in stable condition. 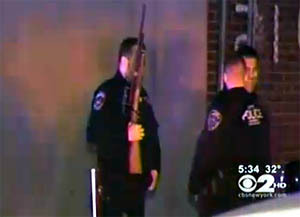 “He had some pretty significant injuries to his leg area as well as his head,” Police Capt. Edward Adinaro said. ILLINOIS -- We look at the mess that is Muddy Paws Dog Rescue in Deer Park and we ask: How could this happen here? How could what was once an established, well-known animal shelter located on a main thoroughfare in the suburbs secretly become home to 19 dead dogs and a pile of feces-filled garbage bags estimated at 5 to 10 tons? These are among the disturbing and difficult questions that beg for answers. 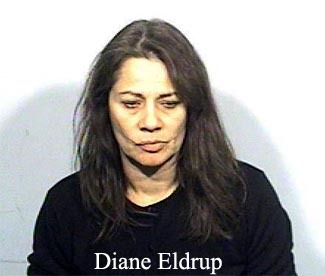 The focal point of the legal case is Diane Eldrup, the Deer Park shelter operator who was arrested Dec. 17 and is charged with 32 counts of animal cruelty. But as Lake County law enforcement officials prepare their case against her, local and state officials also must investigate how Muddy Paws slipped through the cracks of society on a horrific slide to become what one prosecutor called a "death camp for dogs." The sad truth appears to be that state enforcement stopped short of what was needed to protect these animals and local oversight was nonexistent. Shelters, such as Muddy Paws, are licensed by the state department of agriculture. Officials say problems similar to those found last month date to 2009, but the case was withdrawn last May when Muddy Paws claimed to be closed. Deer Park officials dropped their pursuit of a business registration when told a similar story. No final inspection was done by either agency, and no confirmation was made that the shelter was really closed. That's not enough for a facility facing violations with lives at stake. Neither Lake County nor Deer Park was required to regulate the shelter. But wouldn't a local agency working in conjunction with the state be able to react quicker to identify such problems and force corrections? Instead, this enterprise was able to fly beneath the radar. The first outward hint of trouble surfaced only when Eldrup's estranged husband went to the shelter -- where his ex-wife and 8-year-old son lived -- to retrieve some belongings. He saw the dead dogs and called police. Just a year earlier, Muddy Paws was working with two other shelter groups to collect food for local pantries to help struggling families. People drove up and dropped off bags of dog food for a good cause during the weeklong drive. Its problems were also unknown to a Chicago-area pet magazine that included Muddy Paws on a resource list of animal shelters and rescue groups in its January 2011 edition. And, it's not like Muddy Paws is hidden away on some rural road. It is on Rand Road, where it is passed by thousands of motorists each day. Only now are we learning a different story of what was happening there. Changes are needed to ensure this doesn't happen again. 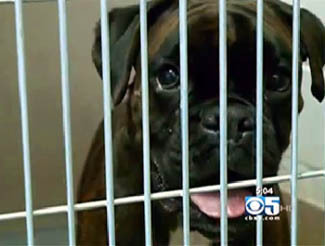 CALIFORNIA -- For the second time in a matter of weeks, dogs have attacked someone in San Jose. The San Jose Mercury News reported that a boxer and Labrador escaped from their yard on Uvas Court on Monday afternoon. The dogs were apparently drawn to the sound of barking coming from a neighbor’s garage. 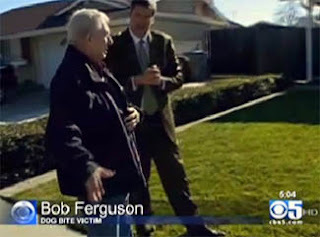 When that neighbor returned from walking his other dog, the boxer and the Labrador attacked 78-year-old Bob Ferguson, knocking him to the ground. Ferguson is convinced he would not have survived the attack, but for a nearby resident who heard his screams and chased the dogs back to the house where they are kept. Ferguson received ten stitches for injuries to his left ear. Many neighbors claimed this wasn’t the first time these two dogs have escaped from their yard and caused problems. 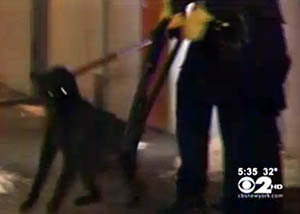 Animal control officers told KCBS that as of Tuesday morning, they had captured one of the two large canines believed to be involved. This was the second vicious dog attack in San Jose in the last 30 days. 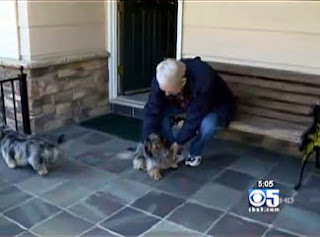 On Dec. 20, a woman in East San Jose was mauled in her driveway by a pair of pit bulls.